Unique handmade paper party supplies and printables. Received it in perfect conditions, item is as shown!!! Happy with my order will be buying from this shop again! Cute, cute. Well made and quick shipment. Today I'm assembling over 30 custom designed passports. I always try to keep a few of my best selling birthday banners cut out and ready to ship. I love having these huge 7" alphabet dies so that I can cut out three of each letter at a time! I loved creating this 3D map heart garland for my customer to use in her engagement photo shoot! 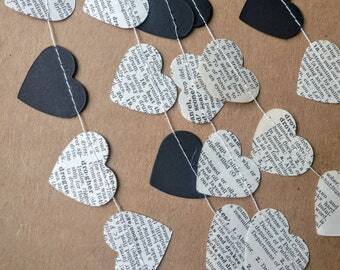 One of my customers used a length of my paper heart garland in a photo shoot for her daughter! My best selling birthday banners were born from a custom request, and have found a permanent home in my shop! Many items in my shop are things that I first made for my own home & had so much interest that I decided to sell them. I have a passion for digital scrapbooking that has translated into making digital subway art prints and digital papers. My shop was born from a failed craft fair. I participated in my first craft fair with a friend & sold basically nothing. So, I put everything that I'd made into my Etsy shop, & sold practically nothing. The only thing that really sold was some paper garland that I'd forgotten to even take to the fair. I had a few custom orders for yards of garland, & that eventually evolved into certain shop staples. I love trying out new color combinations & patterns for holidays. I still get quite a few custom requests, & many of those turn into popular go-to items in my shop. I love how my shop has evolved & focused on something that I really love to make. I've always been a bit of a self teacher. When I see something that I love, I think to myself, "I could probably make that!" And then I go home & teach myself how to do it. When my mother got married, my great-grandmother gave her a set of crocheted snowflakes for her Christmas tree. When I got married, my mom gave me one of those snowflakes. I thought that was so neat, but I wanted an entire tree of those snowflakes. So, I found a book & taught myself how to do thread crochet so that I could have that tree full of snowflakes. When I had children, it became too much of a chore to keep up with my scrapbooking. That's when I discovered digital scrapbooking. I taught myself how to edit photos, create digital papers & embellishments, & now I'm pretty much up to date on scrapbooking all of my photos. When we moved to a new place for my husband's job, I noticed a lot of prickly pear fruit on the local cacti. I'd heard about prickly pear jelly & decided to give it a try. I picked the fruit, put on two layers of gloves, peeled & cooked the fruit & strained the juice. Now, I make blue-ribbon-winning prickly pear jelly. I love to try new things & my crafts tend to reflect that. My interests range from making wooden baby rattles, to paper bunting, sewing dresses for my daughters, to making tasty caramel. I'm a mother, a crafter, an adventurer & a self-teacher. Welcome to my shop! I am an at-home-crafter & I love to try my hand at so many different things! Most recently I've been doing lots of paper crafts, wood working & sewing. I also love to crochet, quilt, do digital scrapbooking & design, & baking. Thanks for stopping by! I hope you've found an item you love and are satisfied with any purchases you've made! Please feel free to ask any questions! Just send me a quick convo. I want you to be happy with your product! If for some reasons you are not entirely satisfied, please let me know within 48 hours after you have received it. You must send it back in it's original packaging and original condition. Let me know if you would like a refund or exchange. Refund will be done through Paypal within 48 hours after I've received the item. Digital items may not be refunded. Payment must be received within 48 hours of purchase from my shop. Payment may be made through Paypal, credit card or Etsy gift card. I am not liable if the address you have listed is incorrect and I do not have any control over how long a package may take to reach you once it has been shipped. I cannot be held liable for any packages that are marked delivered by USPS, but are missing. In addition, any package returned due to a wrong/incorrect address will only be reshipped at the buyer's expense. If you believe your package was delivered to an incorrect address, but provided the correct shipping address with your order, I will issue a refund if the package is returned to me. I typically mail things USPS First Class. First Class mail takes from 3-5 days to arrive. If you need an item to arrive quickly, or just want a guaranteed arrival of 2-3 days, just select the shipping upgrade option when you are checking out to receive USPS Priority 2-3 day shipping. I can usually get orders in the mail the same day or next day, so there isn't a lot of waiting time. • International orders are shipped USPS first class international. Please be advised that you are responsible for any customs fees, taxes or related tariffs that may be imposed by your postal service and government for incoming mail to your country. I can not mark "gift" on the customs form. Shipping in the US usually doesn't take more than a week, so if your item hasn't arrived after a week, please let me know, and we can check the tracking, or figure out what's gone wrong. If you fail to notify me that your item hasn't arrived a month after you order it will be more difficult to confirm whether it was delivered or not, and may interfere with any refund or product replacement. Custom orders must be paid for before I create the product. I will create a custom listing for your order after we have discussed all the details.